I thought Friday was a good time for this post since Friday nights are perfect for game nights. Except in my house, in my house, anytime is the perfect time for a game night. Gregory loves games; card games, board games, charade kind of games, he loves them all! So whether it's Phase 10, Mahjong, or Scrabble, you can bet that we'll be playing something sometime over the weekend. Here's some tips to host your very own fun and easy game night. Anyone who has ever had to entertain guests knows how stressful taking care of others can be. It's especially taxing to try to entertain everyone every day. While spending your days seeing the sights around town can make for a great time, your friends and family won't always have the same set of interests and it's not always easy to get everyone involved. Planning fun events can also wear you out pretty quickly, so here are some ideas to help you keep the pace up when you're running low on steam. You don't always have to do a lot of planning and preparing for a fun night with the friends and family! A great night always starts with great food, but you don't need to exert yourself to create a luxury meal. A more casual approach is sometimes better, and a relaxed meal will help keep everyone loose and excited. Making fondue is the easiest choice here, because it is incredibly easy to do and is a fun way to eat delicious food. Making mealtime an interactive activity is sure to put a smile on everyone's faces, and eating fondue is almost like a game in itself. There are hundreds of fondue recipes out there, but there is no need to worry-making fondue really is as simple as melting your favorite cheese. Or if you're feeling extra sinister, melt your favorite chocolate in a fondue pot and providing tasty treats for dipping. Anything that pairs well with cheese is a great candidate, from fruit to bread or even meat if you feel like putting in some extra effort. Full tummies make for happy guests, and fondue is a great way to get to that point without a ton of preparation and cooking time. Of course, what is a fun night without playing some games? While Pétanque is a great choice for playing outside, sometimes bad weather keeps you indoors with nothing to do. Luckily, there are tons of great board games that are sure to please players of all ages, and they are usually very easy to learn. Carcassonne, a game named after the town in France, is one of the most popular board games in the world and is very easy and fun. Players simply take turns placing tiles that they use to try to complete things like castles and roads while they compete for the highest score. The rules are very simple, but the game still offers a wide variety of strategy for intense fun. An easy alternative to board games is to just pick up a deck of cards. Most people keep cards lying around their home and forget about using them for a fun game night, but card games are some of the easiest games to learn and are universally popular. Poker has become one of the most widely played card games in the world, and for good reason-it's a lot of fun! Even if you don't already know how to play it, the rules are very simple to understand and viewable through the PartyPoker YouTube. Get your friends competing over fake chips or spice up the night by betting over something fun like candy. No matter what you decide, the game is sure to get everyone involved. Of course, if you're really feeling tired after a long day, there is nothing wrong with relaxing and putting on a movie for your guests. A big bowl of popcorn and a fun movie is always a great way to end the day, and it's the easiest thing in the world to pull off. The best part of movies is that you really can't go wrong; put on a cheesy classic for everyone to have a great time laughing with or share a recent release nobody has seen yet; anything goes. Even bad movies are sure to get people talking, but there is nothing wrong with watching something you've already seen 20 times, either. Don't get caught up feeling like you have to go out of your way to entertain guests every day of your life. It doesn't have to be a difficult task. Making sure everyone has a great time can be a remarkably easy feat. Whether you're taking care of your cousin's boys or simply looking for a night out with your friends, make sure you have a great time, too! Phew, just caught up on the last few weeks (ironically, I was in the US) and the last days in Paris. Sounds like fun, if tiring, times were had by all! Bet himself is all chuffed right now with Mr London too! Had a fun evening playing cards in Majorca, especially as the night wore on and more wacky rules got invented. Will have to have a real game night soon! 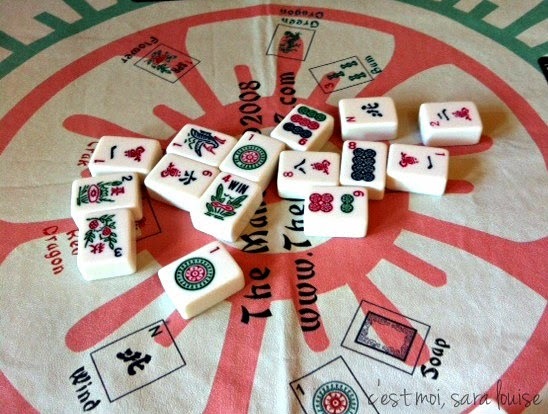 I love the sound of the mahjong tiles crashing together. Reminds me of childhood. The last card game we played was Beloute and I still can't get the rules right.